Anyway…I’ve gotten my grubby paws on a small bag of erythritol, which is effectively a calorie-free sugar alcohol produced from a regular sugar by a natural fermentation process. 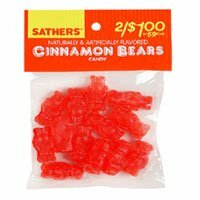 All I should need is one or more thickening agents and some oil of cassia and/or other flavors and I should be able to come up with a recipe for my own pig-out-all-I-want, even-better-than-mass-market cinnamon bears. Food is one of the few areas that I seem to have any natural artistic talent with, so I ought to be able to handle this. The trick is going to be getting the right texture. I’ve found recipes online that use gelatin or pectin. The store-bought product, though, uses “Modified Food Starch”. How exactly do they “modify” the food starch? I vaguely recalled that it was an acid-treatment process that partially breaks up the long glucose polymers, but I wasn’t sure. As any modern nerd would do, I decided to ask My Friend, The Internet. 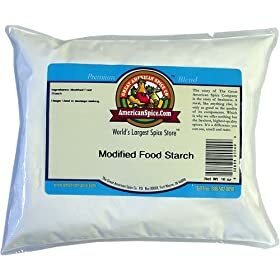 Most places seem to be vague about what exactly the “modification” is, but it became quickly obvious that there were multiple treatments that result in “Modified Food Starch”. Ah, but I was in luck! The Food and Drug Administration actually has a specific entry in the Code of Federal Regulations, which can always be counted on to definitive. So, I went and looked at good old Title 21, Volume 3 of the Code of Federal Regulations and…WTF?!?!? They list a bewildering array of chemical and enzymatic treatments that all get lumped into “Modified Food Starch” (or “Food Starch-modified” as they quaintly put it). I guess my happy new box of “Corn Starch” will have to remain unmodified for the time being. At least until I can figure out how to produce my own ?-amylase [without spitting, that is]. I also have unflavored gelatin and pectin at my disposal here, so I’ll come up with something.